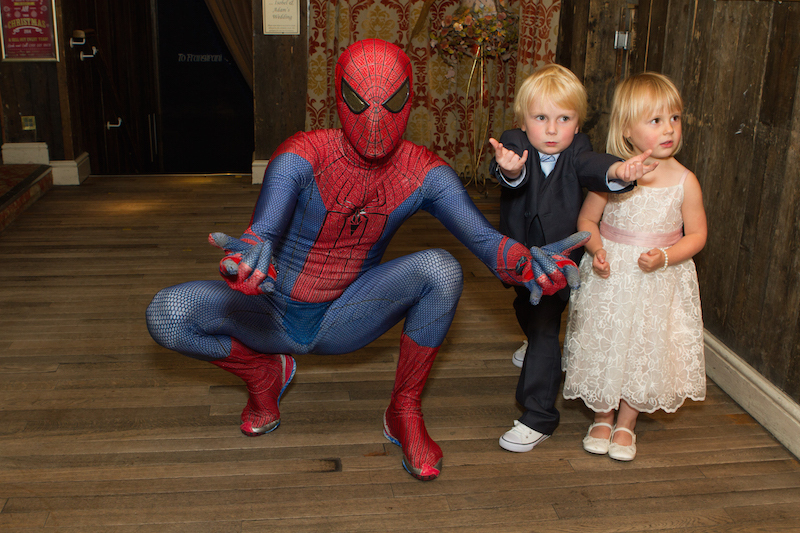 Isobel and Adams's wedding looks like it was so much fun, filled with lots of laughter and love. The setting was just what they wanted. The bride is stunning and I you have to check out the groom's shoes they are great. Our eyes met across a crowded metro carriage and shy smiles were exchanged. I thought no more of it and walked home, only to realise Adam had got off at the same stop and was walking the same way. After turning into my street, Adam turned around and said, "Um...are you following me?" It turned out he was my neighbour. He had been living in the flat below me for 9 months! He slipped a note through my door with his details (so I could check him out on Facebook first! ), came over for a drink a few weeks later and the rest was history! We got together October 2011 and engaged March 2013. We got married in June 2014. My mum was quite ill when we got engaged and we wanted something positive to focus on after she died. Before Adam proposed, he went down to Leeds to let my parents know. The feminist in me would have been horrified if Adam had asked permission but I was touched that he got mum’s approval on the ring – she was so excited. Adam planned a weekend away for us but wouldn’t tell me any of the details. He’s not really one for surprises so I was very excited and tried to guess where we were going the whole way there. We had taken a few trips along Hadrian’s Wall over the years – Adam was really keen to see Sycamore Gap. As well as being beautiful, it is the setting for a scene in Robin Hood Prince of Thieves which is one of his favourite films. The weather had stopped us getting there a few times but this time it was beautiful sunshine. We finally made it and I sat down for a rest while Adam got his camera out. I had dropped my hat in a cow pat (romantic) on the way so I was busy trying to clean it off and didn’t realise Adam had got down on one knee! We celebrated with cocktails and dinner at Matfen Hall followed by a lot more cocktails back at our hotel room. 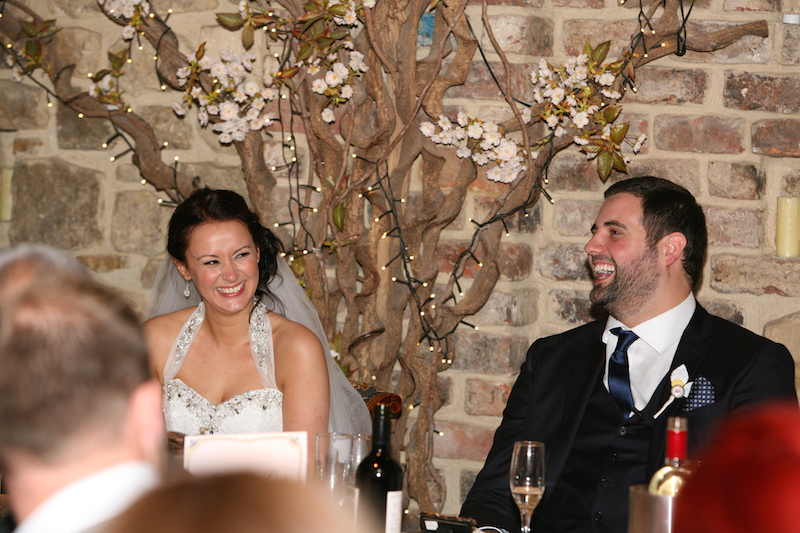 We had the ceremony and reception at As You Like It, Jesmond. Neither of us is religious so a church wedding wouldn’t have been right for us and we loved the idea of having everything in one place. Only two. The first we visited was a manor house in Northumberland. While it was beautiful, it wasn’t quite our style. Adam’s job meant he had worked with quite a few cultural venues over the years so wasn’t keen on anywhere he might associate with work so that took a few off the list. 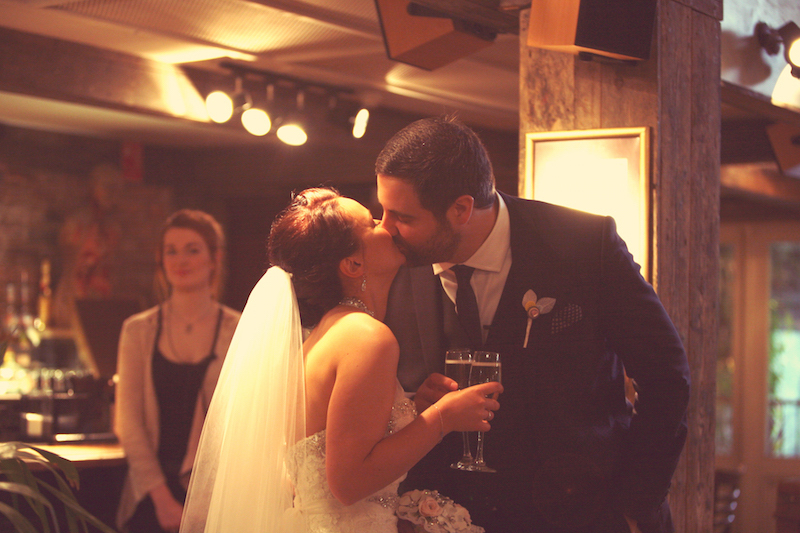 We wanted a venue that reflected our personalities and As You Like It was perfect – we didn’t want a cookie-cutter wedding and this venue gave us the freedom to be ourselves. Plus we already knew how great the food and cocktail menu was! My mum was too ill to come with us by the time it got round to wedding dress shopping so my sister, sister in law and mother in law came along. We sent her photos throughout and one of the last emails she was able to read was a picture of the dress I went on to wear. I went to a few shops in Harrogate (I’m originally from Leeds) but eventually found my dress at Kathryn Trueman in Morpeth. I couldn’t recommend them more highly – they aren’t pushy really listened to what I wanted. 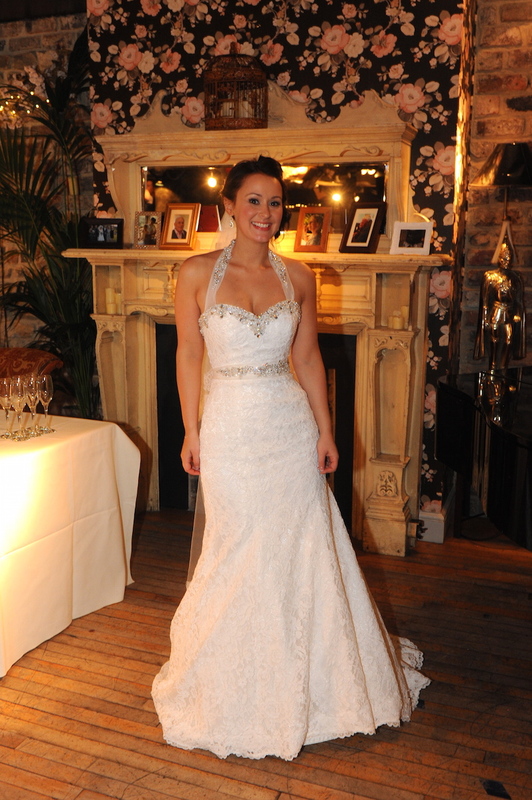 I altered the dress quite a bit – adding a bit of sparkle with a belt and a halter neck and it fitted perfectly. My shoes were from Irregular Choice – they make really quirky but surprisingly comfortable shoes. For the evening, I changed into high-heeled Converse - all of the groomsmen wore converse so I thought it would be a nice touch. The bridesmaids’ dresses were a little trickier. My best friend Amy lives in Australia so we had to buy a dress and hope it would fit when she arrived! 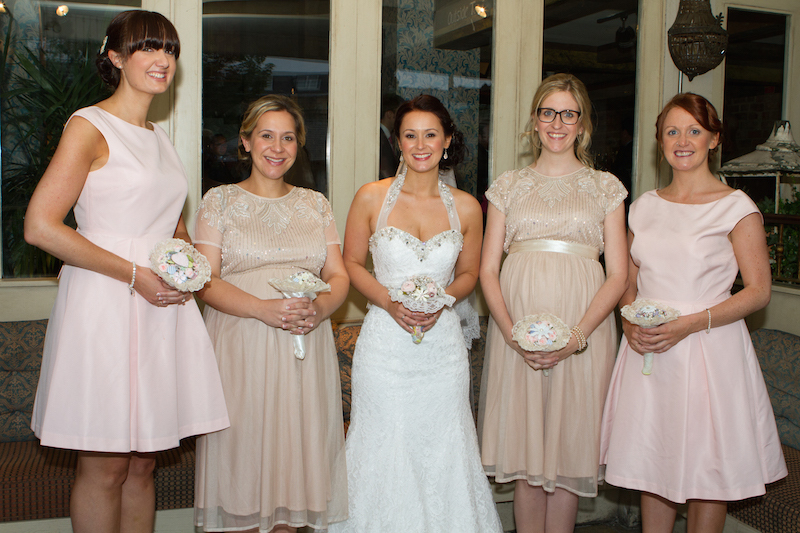 Amy and sister-in-law Lauren wore pale pink Ted Baker Dresses. My two other bridesmaids (friend Rachel and sister Juliet) were 7 and 8 months pregnant at the time of the wedding so I just gave them some money and asked them to decide between them what they would be comfortable in. Luckily they went for beautiful gold dresses which fitted in perfectly. 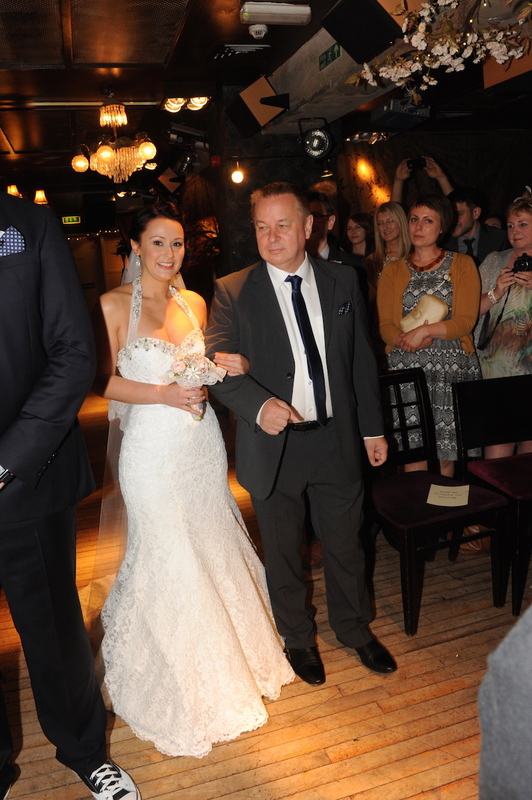 We wanted our wedding to be really personalised. 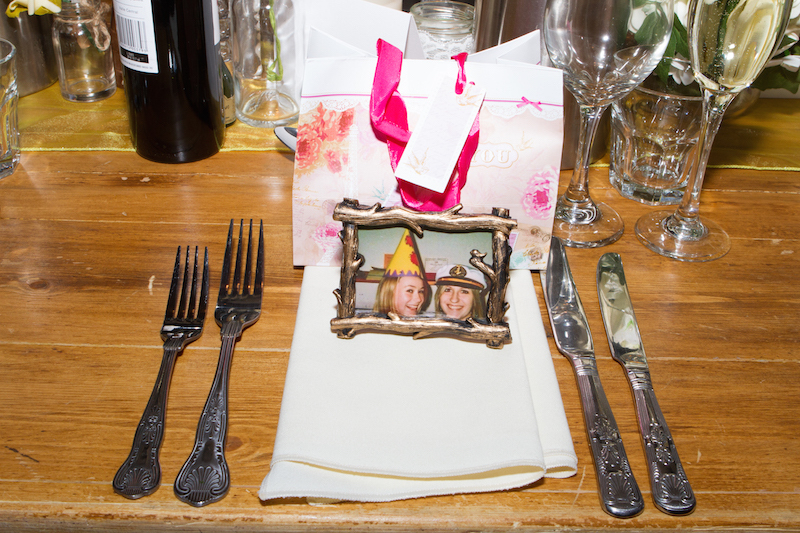 Instead of place cards, each guest had a mini photo frame featuring a picture of themselves with either myself or Adam (or sometimes both). 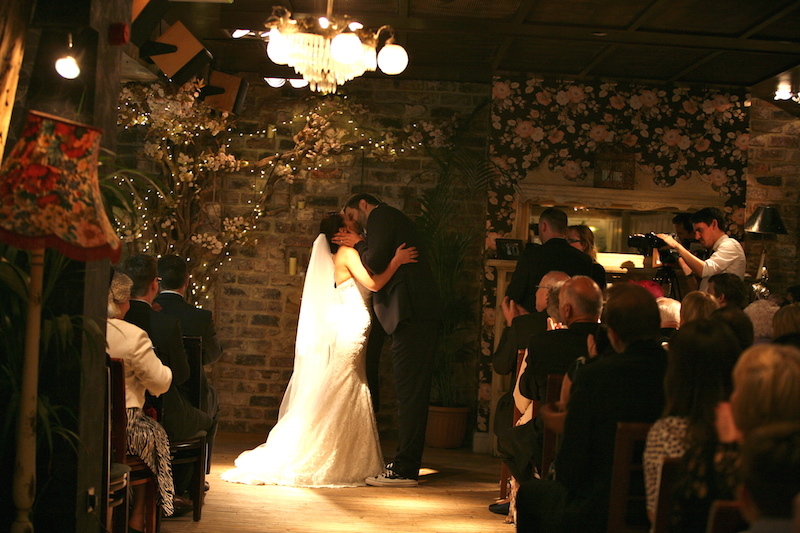 We decorated the venue with photos of our family and friends on their wedding days and passed around video cameras so the guests could make their own videos. My mum was a big part of the wedding planning and although she couldn’t be there we tried to make her as big a part of it as we could. Her photo was looking out at us as we got married and we kept an empty chair at the top table where she would have sat. I’m a massive fan of Pinterest so I was in heaven! I’m pretty organised anyway (I always have a few planning spreadsheets on the go) so I found it fun but I can see how people might be stressed by it. I loved looking at wedding blogs and Pinterest boards to get inspiration. My sister in law got engaged a few months after we did so it was lovely to have someone to share it with. 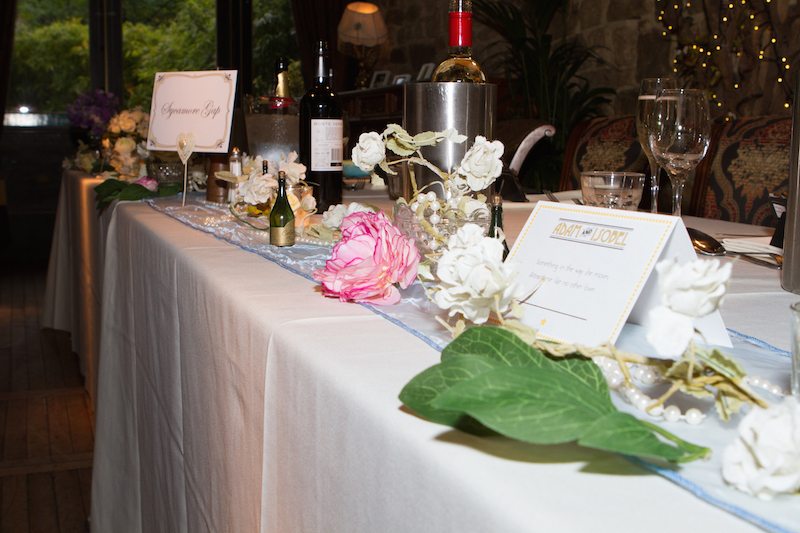 Did you do any DIY projects for your wedding? Loads! I love making things so I really enjoyed this part of the wedding. 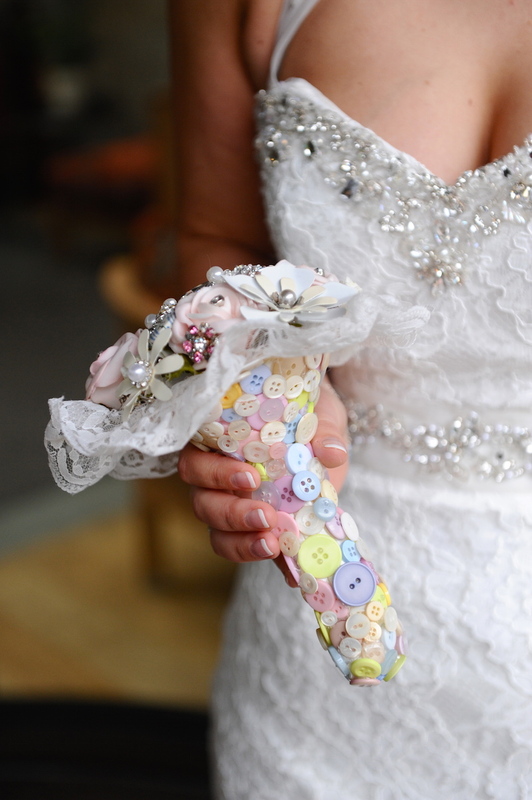 I made brooch and button bouquets for myself and the bridesmaids, buttonholes, favours, table decorations and put together gift bags for the bridesmaids. The bouquets were the most time consuming but also the most fun. Lots of my friends and family donated brooches and buttons so they were really personal. Adam was surprisingly vocal about the décor. He was mystified that venues would have chairs so bad you would need to cover them up, or that anyone would want a birdcage as a table decoration (a cage at a wedding probably doesn’t send the best message!). 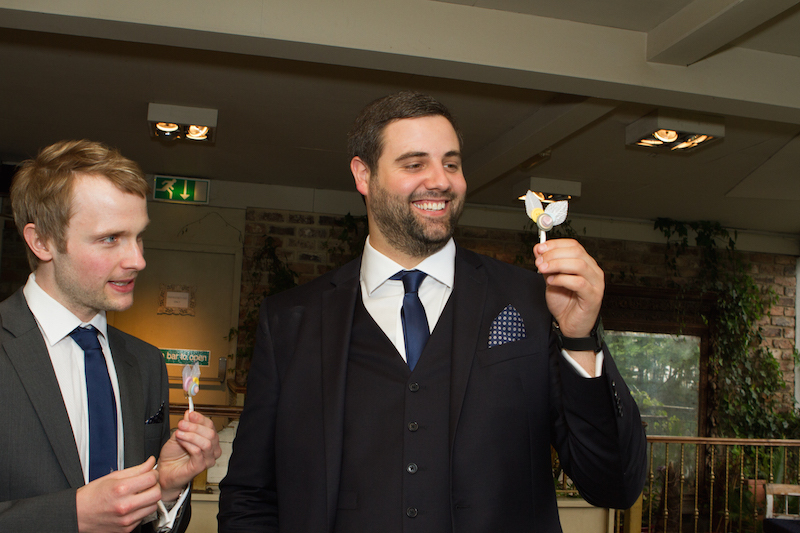 While I took care of a lot of the practicalities, Adam kept me focused on making sure the wedding reflected us as a couple rather than the demands of the wedding industry. The planning itself wasn’t too stressful for me but the anticipation on the day was the worst part. I’m quite shy and the thought of standing up in front of 100 people was terrifying to me. As soon as I saw Adam, I completely forgot anyone else was in the room. Before the wedding, I gave all of the vendors my sister’s contact details and asked them to get in touch with her if there were any problems. I would definitely recommend this to any stressed brides! My dad is a professional composer, so we had him play the piano during the signing of the register. 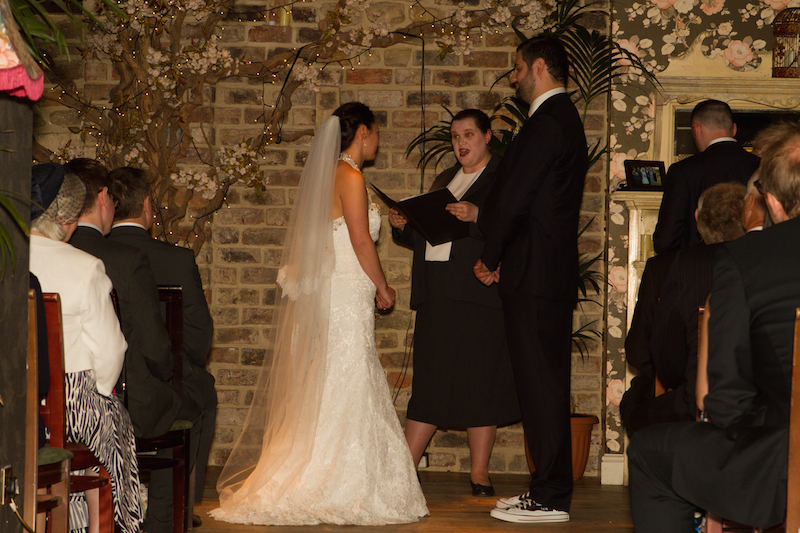 It was really lovely and added an extra personal touch to the ceremony. Adam and I are really into music (most of our holidays have been to foreign music festivals) so we planned every second of the music. A live band wasn’t really our thing so we planned the entire playlist on our iPods. Planning the playlist was a lovely way of spending time together before the wedding. 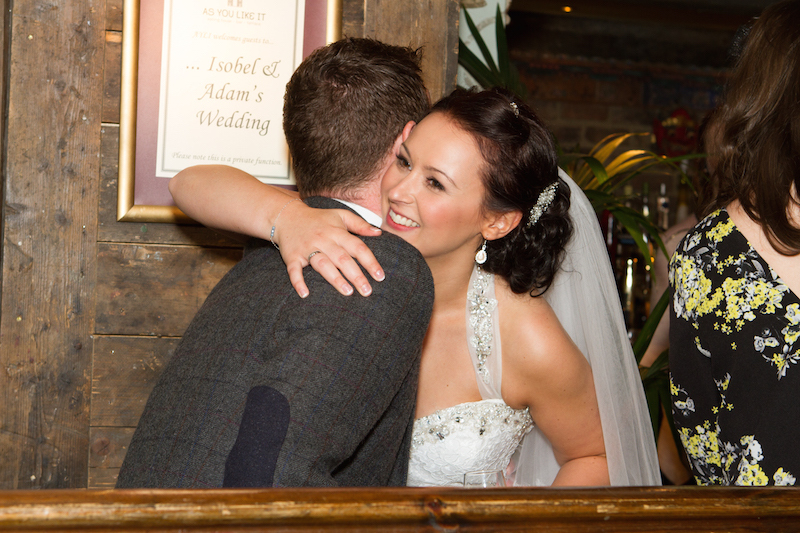 We got married, which was the main objective for the day! It poured with rain for most of the day but we barely noticed. We knew it was a possibility, so we had a backup plan with the photographer and still got all of the shots we wanted. 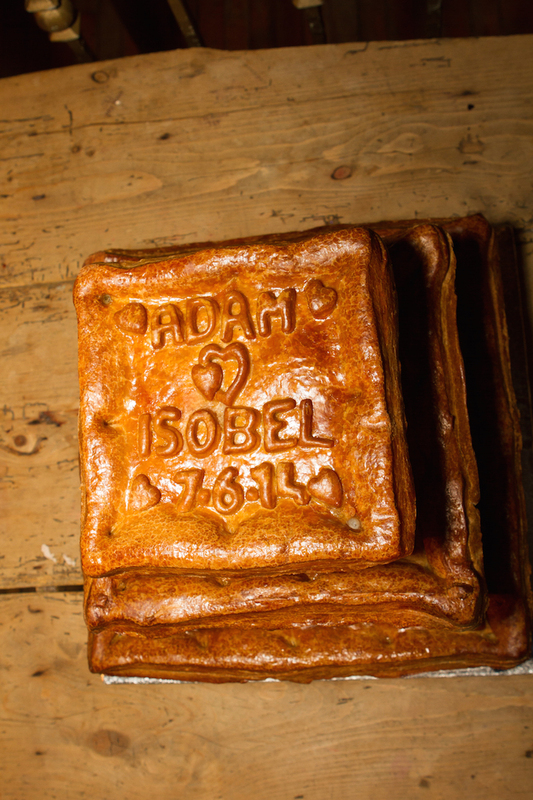 The pork pie wedding cake was a bit of a surprise to some people! I was appalled at the price of wedding cakes and we’re both much more into savoury than sweet. Plus it proved an excellent hangover cure for the guests the next morning. 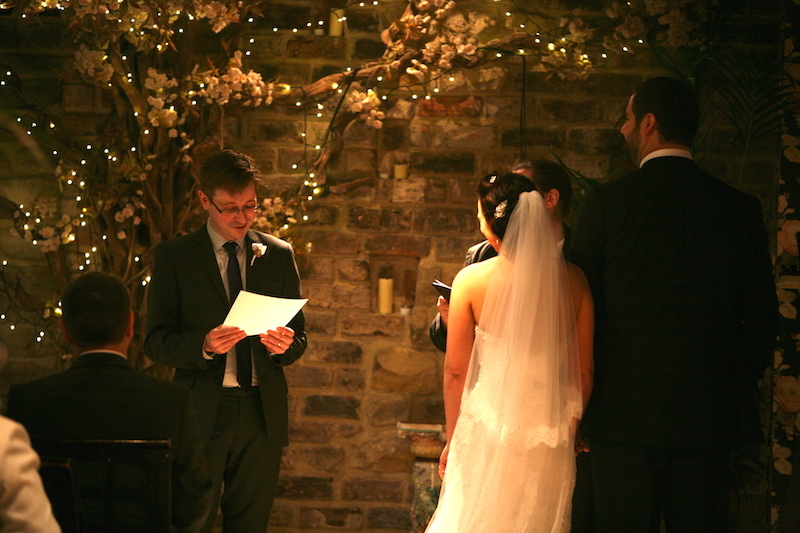 We used the Roger McGough ‘Vow’ as our vows – we wanted something a bit more personal to us as well as the usual vows. It’s a really special poem to us and we’ve quoted it a couple of times when things have got tough! Relax! Most of the things you worry about are things nobody else will even notice. Don’t lose sight of the fact that you are there to get married. It’s easy to get lost in a whirlwind of chair covers and favours and forget what the point of the day is. And definitely, take a few minutes alone with your partner after the ceremony. It’s an amazing feeling and you should enjoy it together. Both of my parents are from New Zealand so we took a trip in January which coincided with my cousin’s wedding. We travelled across New Zealand and ended the trip with 5 days in Malaysia. Instead of a registry, we set up a gift list on our website (http://adamandisobel.gettingmarried.co.uk) so guests could contribute to the honeymoon and we sent them a photo when we had done whatever they had paid for. It was an absolutely amazing trip and attending another wedding on your honeymoon is brilliant! Videographer - Top Table Films. Jon was brilliant, I’ve never seen a wedding video like it. Flowers - I have pretty bad hayfever (hence the brooch bouquets) so all the flowers were fake! Entertainment - We planned the playlist down to the minute so all music was our iPod. Adam’s cousin Lucas was Master of Ceremonies and did all of the announcements. Chair covers - We loved the chairs as they were! Groomsmen Suits - Jeff Banks from Debenhams, groomsmen all in their own suits and Converse trainers. Wedding Car - Love Dub Cars provided our wedding cars – a VW Beetle and Campervan. 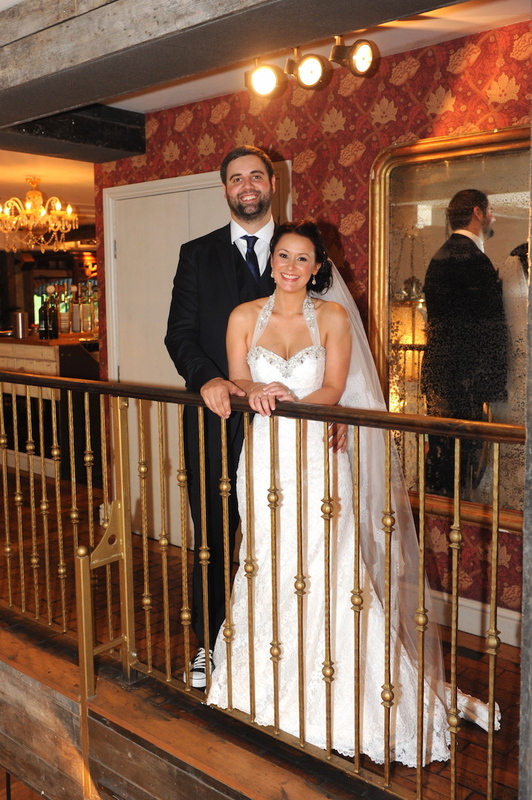 They were brilliant on the day, taking us out after the ceremony to enjoy a glass of fizz and a moment of quiet.